A “Diverging Diamond” interchange has been installed and is now open at highway 270 and Dorsett Road and watch out red-blooded Americans, but for just a second it will have you driving on the “wrong” side of the road! The terrorists have won. A diverging diamond interchange is a rare form of diamond interchange in which the two directions of traffic on the non-freeway road cross to the opposite side on both sides of the bridge at the freeway. It is unusual in that it requires traffic on the freeway overpass (or underpass) to briefly drive on the opposite side of the road from what they are accustomed. 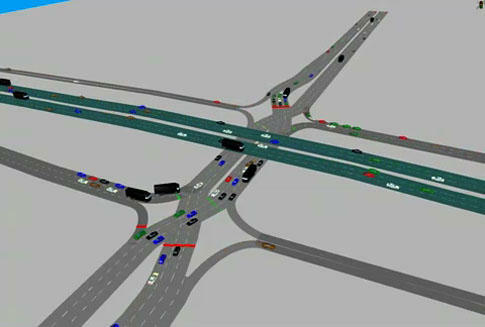 The diverging diamond interchange was listed by Popular Science magazine as one of the best innovations in 2009 (engineering category) in “Best of What’s New 2009”. This is really a brillant idea. It allows for easy flow to get on either direction of the highway with zero detriment to the traffic staying on Dorsett and all it will take the littlest bit of ablilty for St. Louis drivers to read and comprehend traffic signs and not be dumbass hoosiers about driving on the other side of the street for 100 feet. …This isn’t going to work is it? There’s even a video on YouTube (see it after the jump) explaining how it all works and proving that not only is it not confusing, but actually will be a huge benefit to commuters. St. Louis YouTube commenters are crapping all over it though. Could we possibly make these intersections more complicated? I don’t think so. “…also how the hell are you supposed to work these DVD players? Hit input my son says? What input?! All I know is I want to watch the first season of Mama’s Family and I ain’t no dang scientist!” Here’s hoping he doesn’t believe in voting. This is going to make my drunken drive from Westport to Denny’s incredibly difficult!! The more you know: The first “DDI” was in Missouri as well actually, appearing in Springfield, MO on June 21st, 2009. Even more stuff to know: You know that thing you do when you try to discreetly check to see if your zipper is up at work? Everyone notices and knows exactly what you are doing.